SYNOPSIS: “EVERYONE LOVES IVY” part one! Mikel Janin returns to BATMAN for a brand-new epic! Pamela Isley’s influence can spread as far as vegetation will allow, putting the whole world at her fingertips. Can Batman and Catwoman stand their ground against an entire planet of Poison Ivys? After surviving the swords of Talia al Ghul, celebrating a double date with Superman and Lois Lane, and enduring Batman’s banishment to another dimension with Diana, Bruce Wayne and Selina Kyle are rested and ready to take on the entire world… and thanks to Poison Ivy, they’re going to have to. Mikel Janín returns to these pages for the first time since “The War of Jokes and Riddles” ended, and his handsome pencils and precise inks flourish as always under the premium palette of color maven June Chung. Actions and expressions and eyes are their specialties here, invigorating Tom King’s creepy script with emotion, momentum, and menace. It’s an absolutely beautiful book that capably captures the dread of its premise. 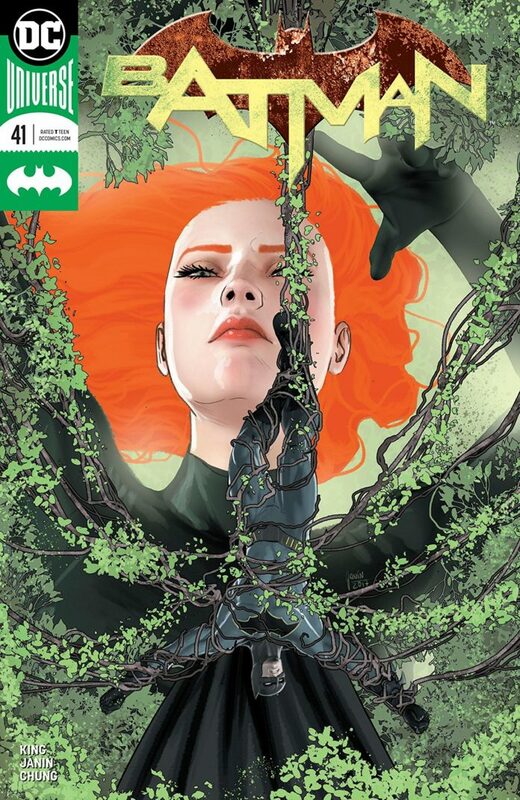 Just as he made The Riddler deadlier than ever and turned Kite Man into one of Batman’s most interesting and tragic foes, King seeks here to elevate the horticultural horrors of Dr. Pamela Isley to a global level. And he goes big by keeping it small, with Ivy talking to Bruce and Selina via Alfred, all while accessing Pennyworth’s secrets. Ivy knows everything. Ivy is everything. Ivy is everyone… except for Bruce and Selina, who have to find a way to liberate 7.6 billion souls from Ivy’s control. And the way Ivy prevents Bruce from snapping Alfred out of it is one of the most inventive and awesome and unpredictable things that’s happened in these pages since King took the helm, and that’s saying something!